Voting to confirm Judge Neil Gorsuch should be a no-brainer for Colorado’s elected officials. According to former Colorado Democratic Party Chairman Floyd Ciruli, who compiled a series of polls about whether Coloradans approved of Gorsuch’s nomination and potential confirmation, Coloradans love them some Gorsuch. 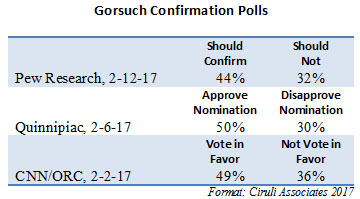 Each poll is overwhelmingly positive for Gorsuch. See the poll compilation below. By 12 points, Coloradans think he should be confirmed (44% to 32%). By 20 points, Coloradans approve of the nomination (50% to 30%). Given that Gorsuch is from Colorado, the people here love him, and he’s done a phenomenal job in the hot seat at his confirmation hearings, what is the hesitation from U.S. Sen. Bennet? We guess that it’s just the political gamesmanship that the Democrats are waging because they miscalculated their presidential candidate’s appeal (or lack thereof) and thought they would have another bite at the apple with Merrick Garland, so they didn’t fight as hard as they could have to get an up or down vote for President Obama’s pick. That’s their problem, not President Trump’s problem or the problem of Coloradans. If Democrats want to blame someone for the fact that Garland does not currently sit on the Supreme Court, they should look in the mirror. Elections have consequences.